People who have floaters report seeing “shapes” moving in their field of vision. Floaters may appear as dots, circles, lines, clouds, cobwebs, spiders and other shapes. Floaters are usually small and move fast out of the field of vision. Flashes of light sometimes appear with floaters. Flashes look like flashing lights or lightening streaks, even though there is no actual light flashing in the room. Flashes are usually noticed at night or in a dark room. What are the causes of flashes and floaters? When we age, the vitreous (the jelly in the middle of the eye) thickens and starts to shrink, and this causes it to pull away from the retina. This event is referred to as a posterior vitreous detachment or PVD. Debris from the detachment site drifts into the vitreous and manifests visually as floaters. When PVD happens, a floater usually develops (see above). PVD can also cause the vitreous gel to pull on the retina, sometimes inducing a visual sensation of flashes. 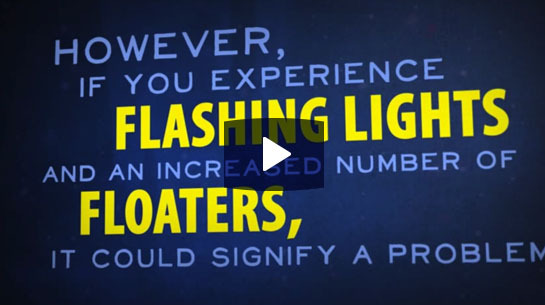 When a person is seeing several floaters and/or flashing lights, it is often a sign of PVD. In most cases the vitreous will separate cleanly from the retina and will not cause any further problems. The flashes gradually fade away, and then disappear altogether. Floaters caused by PVD may continue, but typically become less noticeable within 2-3 months. There is no treatment for PVD. Observation alone is required, and advice to return for further examination should symptoms deteriorate. If the vitreous is strongly attached to the retina, or if the retina is weak in a certain area, a retinal tear can occur as the vitreous separates from it. Retinal tears can be treated with laser to prevent them from evolving into a retinal detachment (see below). Once a tear develops, there is a high chance that fluid will pass through the tear, causing the retina to detach (akin to wallpaper peeling off a wall). If the retina detaches from the back of the eye, partial or total loss of vision may initially occur, and if left untreated total and irreversible loss of vision invariably occurs. The retina is reattached surgically by a procedure known as vitrectomy and/or a buckling operation. The success of retinal detachment surgery is dependent on many variables, including the age of the retinal detachment (i.e. in general, the sooner a retinal detachment is operated upon, the greater the chance of success). You cannot prevent floaters and flashes from occurring, but you can prevent vision loss if these symptoms are attributable to a retinal tear or a retinal detachment. The appearance of flashes or floaters, or an increase in existing symptoms of flashes and floaters, should prompt you to have your eyes checked thoroughly by an ophthalmologist.